A good amount of news coverage and scholarship about the role of social media in political movements has been trending for some time. Most recently, news articles and blogs have documented how the use of social media like Twitter helped fuel and organize the protests in Ukraine, which ultimately led to the expulsion of its president, and the escalating crisis in Crimea. Just a few weeks ago I attended an academic conference investigating the relationship between the ‘cyber’ and the ‘urban,’ especially in the context of social or political movements. But my own research has forced me to beg the question: what about the anti-politics of social media? For those of you who have been following my blog, you will already know that I have spent the last several months conducting an in-depth anthropological study of a self-proclaimed “internet community” in Indonesia. This tight-knit urban neighbourhood of roughly 25 houses has dedicated the last six years to improving the quality of socioeconomic life by disseminating access to the internet. But while the community has banded together for the explicit purpose of using technology to promote self-sufficiency based on social values, there is no indication that this translates to political action via the internet. There seems to be a kind of paradox emerging in the neighbourhood, known to locals as Kampoeng Cyber. Even as the access to their internet was made possible by the political wile of their elected leader, it appears that most residents are almost systematically averse to expressing political views via social media. By contrast to more widespread “movements” that have built their momentum on the astute use of such technologies, many of these residents will have nothing to do with politics, a word that sometimes even makes them cringe. One informant, for instance, claimed that he intentionally deleted three of his Facebook friends after he realized that too much of the content they posted was political in nature, encouraging heated discussions that completely put him off. Annoyed that these posts were intruding on one of his favourite forms of entertainment, he opted to remove the irksome perpetrators to restore the balance on his newsfeed. Now he could return to enjoying the silly or funny (konyol) posts that he regularly logged on to read. In fact, it appears that many of the posts that might be interpreted as political in nature are often presented in comedic light. The only time I saw a photo of Vladimir Putin, the President of Russia, posted to Facebook was from someone asking, in the style of an inside joke, who among his friends was his doppelganger. 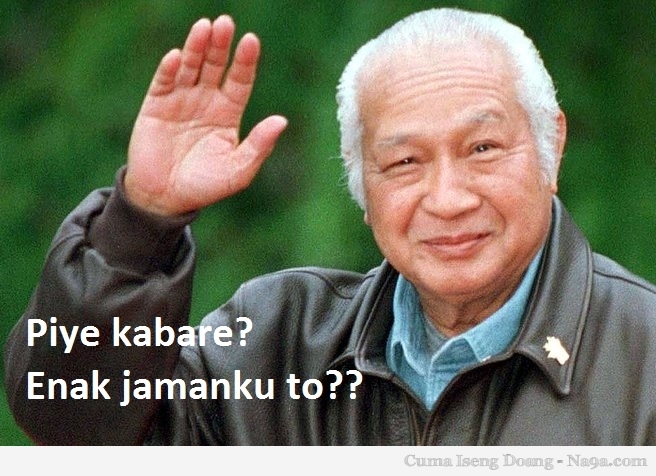 Indonesian President Susilo Bambang Yudhoyono (SBY) has appeared once or twice on my newsfeed as a humorous internet meme, along with the once notorious, and now nostalgic image of the former President Suharto. But beyond eliciting a few comic remarks in the comments section of the post, these political images usually quickly get lost in the sea of posts that come after. One of the standard questions I ask during interviews about social media use patterns is whether they like to post or read ‘political’ content on their favorite social networking sites (usually after a brief discussion eliciting what politics means to them). Most of the responses I have received so far have been negative, yet more detailed explanations of why that is so are difficult to come by. Many simply shrug their shoulders and reiterate their dislike for politics, noting corruption as a major reason for which they find the subject not only tedious, but fruitless. One Facebook user has gone so far as to describe her political views on the “about” section of her page as “bah, politics just gives you a headache/makes you dizzy” (lha POLITIK Kui Nggawe MUZZMET… ). Another explained in more detail that she felt there might be a general fear, or uneasiness, about posting political opinions on news links, for example, because there have been cases where commentators have been singled out by the government and punished for their opinions. Although I cannot verify these cases, her comments speak to a possibility that the legacy of Suharto’s autocratic rule might still be affecting a sense of free political expression in Indonesia. It would, of course, be unfair to claim that there is no political expression on social media beyond spreading jokes. There have been a few cases where users have claimed to make it their aim to use such media as a way to express their political beliefs, such as social and gender equality, while others who live outside of Kampoeng Cyber have regularly posted political views or news articles, though these have tended to be the most highly educated among my informants. As I continue my study I hope to add cases and nuance to what I have observed so far. Yet what I find most puzzling and intriguing about the apparent tension between politically motivated internet-access programs and the lack of political expression via social media, is that it doesn’t seem to be isolated to Kampoeng Cyber. While the community I have chosen as my field site is the first to have dubbed itself a “cyber village” in the area, it is not the only one. Last week five representatives from a large neighbourhood in Solo, Yogyakarta’s sister city located two hours away, visited the leader of Kampoeng Cyber for advice on how to improve their own “Internet Community.” This neighbourhood, consisting of about 30 internet connected houses (though in a larger population), has obtained funds from the city government to promote social cohesion through connectivity. Like Kampoeng Cyber, they have been operating since 2008, yet have independently established similar goals. In the meantime, another neighbourhood in Yogyakarta that now goes by the name of “Suronatan Digital Village” has set up cheap neighbourhood-wide WiFi access only a stone’s throw from my field site, a government initiative meant to encourage education and economic development. As I move forward with my research, I will be looking systematically at the objectives and manifestations of these different internet communities to gain a better understanding of how the explicitly political goals of producing economically independent, socially-based moral communities results in the production of anti-politics in social media.